Create an attention-grabbing reel of animated work that showcases your classical animation techniques, storytelling skills, and grasp of modern digital tools. Delve into the fundamentals of drawing, animation, and basic art direction. Enhance your drawing skills with storyboard and background design exercises. 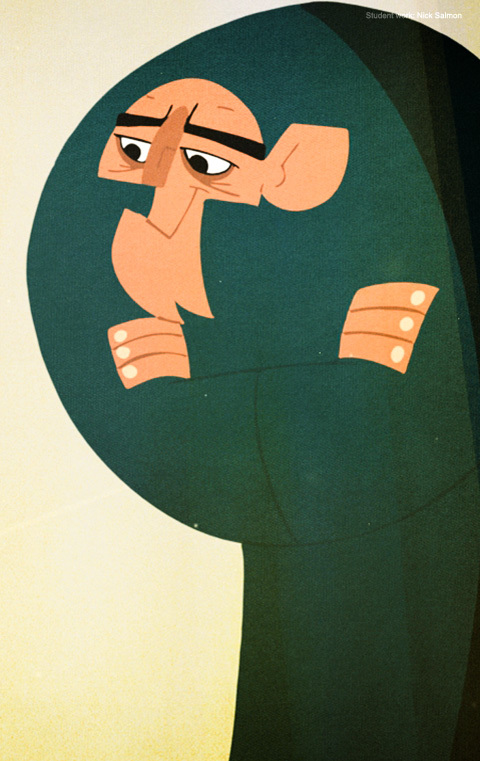 Explore more complex animation concepts like animating a character’s thoughts and emotions through acting principles. Create storyboards for an animated film, character model sheets, layouts, and final artwork for rendering. Progress to the art direction, digital ink and paint phase of production on your final project. Assemble a traditional animation portfolio in preparation for graduation. Send samples of your work that include still-life drawings, life drawings, and character sketches (maximum 12 pieces). You'll find information on how to send your work in the application form, or you can ask your Advisor. The new 42,000 square-foot Animation campus is located in the middle of downtown Vancouver. This facility closely mirrors a real-world professional studio and gives you access to every amenity you will need to create amazing work, from studio space to a custom-built life drawing theatre. "I wake up every day full of energy and happiness with a smiling heart because I know I’m learning from the best and also in one of the best animation schools in the world." "I put in long, time managed, focused hours of hard work every day of the week for months at a time. As a result I was blown away by my rapid improvement as an animator and an artist." "There were a lot of reasons why I chose VFS: The first being the faculty and the second being the glorious city of Vancouver. It was the first time in my life I ever felt like I was somewhere I belonged." "Learning the fundamentals of animation from a great faculty, with an intensive time schedule, helped me learn so much in a short time frame. I am currently working in the animation/gaming industry as a 2D artist, and I animate in my spare time, none of which I could have done without my experience at VFS." "The school was great. I still remember things the teachers taught me. It really gave me a great foundation. It works." "It will try and test you in a thousand areas that you didn’t expect. Leech every drop of information and experience you can out of every millisecond that you’re there because I guarantee that when it’s over you will weep bitter tears that you couldn’t stay another hour."